The SureFit™ Thermal Helmet Liner is fully approved to be worn with all JSP EVO® Safety Helmets. It prevents workers from wearing incompatible and dangerous alternatives such as hoodies underneath their helmets. It provides all day comfort and warmth. The SureFit™ Thermal Helmet Liner provides the wearer with warmth and protection from cold environments. The deep edges are designed to cover the entire ear. 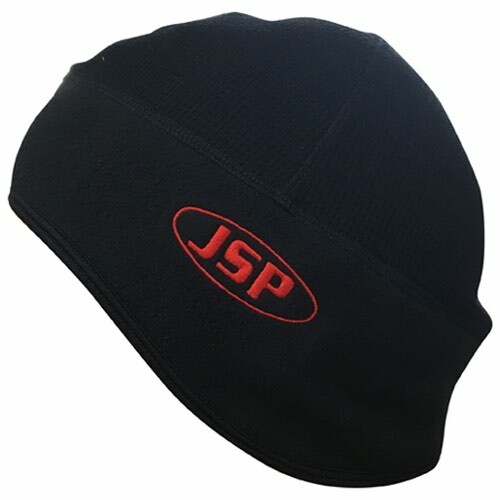 The SureFit™ Thermal Helmet Liner is compatible with all JSP safety helmets. The stretchy material it is suitable for all head sizes and provides a nice tight fit for minimal interference and maximum comfort and warmth. The SureFit™ Thermal Helmet Liner is lightweight for all day comfort and is also machine washable at 30°C for hygiene purposes.